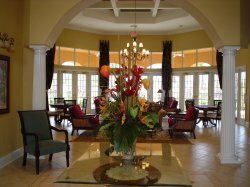 Solana is one of Florida's family vacation resorts of choice in the Disney area. Our five-bedroom, 4 bath home (which includes 2 ensuite master bedrooms), is a spacious house with a south facing pool and spa, located just two minutes walking distance from the club house. 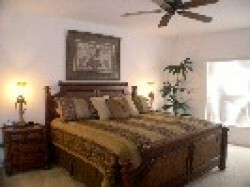 It is fully air conditioned and has a privacy fence out back for your peace of mind. The bedroom set-ups consist of one with a king-size bed, three with queen-size beds and one with a twin bed setup, and are configured to allow for comfortable sleeping for ten. 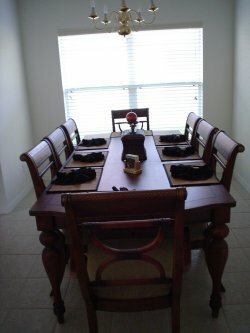 The house will accomodate sleeping arrangements for as many as twelve people. 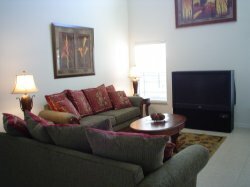 Bedrooms are equipped with comb-ination television/DVD players, and the living room has a large screen tv, a DVD/VCR combo, a home stereo system, and a quiet sitting/reading area. Balance to be paid - 4 Weeks Prior To Sta to arrival.